Tools to work pallets: What hardware do you need? The nice thing about palettes: their structure is quite crude and coarse. Say, you can (and have to) work/deal with structures which usually don’t have to be accurate to the millimeter. In fact, it’s quite difficult to do so, and a significant part of the charm of the results: slightly crude, slightly improvised, but nicely structured and quite natural. So, what tools what do you need? I use a standard sandpaper grinder which does the job. Of course you can still deal with angle-grinders and brushes, but as long as your pallets are clean and the visible surfaces and edges are polished/rounded/grinded, i’m perfectly happy. Nice side-effect: you need less paint the smoother the surfaces are. Inner edges and slits are difficult to reach/grind, but paint usually fills them up. Sandpaper: 80 or 60 grit is ok, i don’t use finer grades usually, just when i don’t have coarser stuff. Should be strong enough to handle the thicker bars of a pallet. Get a solid wood blade too. Drilling holes is rarely needed, usually everything is achieveable with self-rotating screws. Usually screwed with an electrical screwdriver/power drill. Small brush, paint roller, paint. More on this matter later. Ordinary pliers for pulling out nails. A roofing hammer is usually sufficient to lever out unneeded boards, nails and stuff. A pair of pliers, because you always need a pair of pliers. Cool tools for the coarser stuff. Stubborn nails, projecting beams and endges too long to sandpaper are dissected and destroyed by the pure, raw power of the angle grinder. Moreover, succumbing only to crowbar and the mighty chainsaw, an angle grinder is a great and powerful tool everyone should own. If you want to buy one anyway, get it. A crowbar is a powerful device, emanating raw force and violence. To work with a crowbar is not as great as with a chainsaw, but its as near as it can get. A crowbar is a great and rukling device and I’ll buy one in the near future just for its greatness and its indispensability at the zombie apocalypse. So far i never needed one beside the jigsaw, but it seems occasionally the better tool to me to use, especially for long, precise and smooth cuts. Most of the time i prefer the jigsaw because of its flexible and handy use. Otherwise: space, time, tolerant neighbors regarding an occasionally noisy environment. Fun with wood and tools. Depending on the project: timber beams and plywood. Screws/Chipboard Screws, 3,5x60mm and 2,5x30mm are the lengths i mostly use). 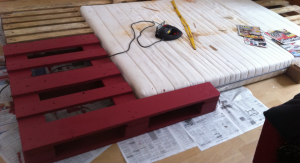 And, of course, pallets.